Patagonia continues to be a ‘landscape of the imagination.’ Encompassing the southern third of Argentina and Chile, the region is often referred to as ‘the end of the world’ and the ‘uttermost part of the earth.’ While Patagonia has been—and in many respects continues to be—defined and mythologized by traveler narratives, a growing historiography has revealed various social histories in this supposedly people-less landscape. Alberto Harambour-Ross’ dissertation enters this discussion with a borderlands history of Patagonia, one that switchbacks across the southern Andes as well as across the Atlantic to England and Germany. This approach to understanding Patagonia is novel and welcome, and provides big picture conclusions. 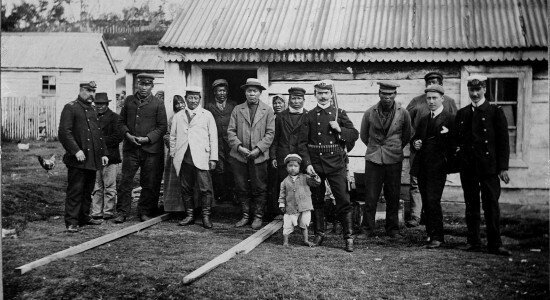 Harambour-Ross seeks to understand ‘frontier expansion’ in southern Chile and Argentina within the context of a “world-wide imperial impulse in the late 19th century” (iii). By exploring human and non-human networks (primarily sheep), he tracks the rise of state and economic forces in the region through working class and racial structures. He notes that the wide and seemingly endless horizons of the Patagonian steppe offered a new future for settlers who often had a past they wanted to forget. However, capitalist expansion, imperial exploration, and independent state-building entangled to limit the utopias that Patagonia offered. To unpack these entangled elements, Harambour-Ross builds upon borderland studies, and argues that regional case studies allow one to analyze the complexities of global, national, and local intersectional histories. Patagonia and its indigenous people evaded Spanish colonization, and therefore, Harambour-Ross describes Patagonia as an ‘inner frontier,’ a liminal space that was both inside and outside the fledgling nations of Argentina and Chile. He compliments the historiography of borderlands studies with theories ranging from Bourdieu to Benjamin regarding the state, civilization, and barbarism. Departing from Agamben’s ontology of the state and an isolated Salazar’s social/subaltern sovereignty, Harambour-Ross seeks to historicize frontier sovereignty in all of its productive tensions. This was no small feat; the spaces in question in this study, once integrated, would nearly double the size of both Chile and Argentina. While Harambour-Ross uses the phrase ‘postcolonial colonialism,’ it becomes immediately apparent that Argentina and Chile rarely had clear visions or resources for such colonial expansion. Rather, for Harambour-Ross, building upon Braudel, the state and capitalism were intrinsically linked, and in the case of Buenos Aires and Santiago expanding south, this meant linkages with Liverpool and Hamburg. The common denominator, he notes, was property: “The sovereignty of capitalism swept Patagonia and produced, an amazingly rapid national formation” (14). In this sense, Harambour-Ross’ most direct departure from the Patagonia historiography is to show that while there may have been a sort of exceptional autonomy in the Chilean and Argentine south during this period, it was not insular or isolated as an autarchy, but was instead wholly reliant on foreign capital and an export economy that drove credit markets and land monopolization. Harambour-Ross identifies four key periods of expansion in his dissertation: 1843; the 1870s and 80s; early 1900s; and the first years following World War I. Chapter one argues that while questions of geopolitics and nationalism were important to southern expansion, they were always second to commercial expansion and consolidation. European interest in the region dated back to the early 1500s, though the common tropes of emptiness and infertility came to define the land. While such characterizations continued, the end of the 19th century presented a new narrative of possibility. In the wake of a failed penal colony, Chile finally occupied the Strait of Magellan in the 1840s through steamships and the expanse of commerce with Great Britain, not from political or military might. Chapter two focuses on the creation of juridical territories through governmental appointments, laws, and degrees. While Patagonia could have been converted from a cursed land to a promise land for the early settlers of the 1880s, by the 1910s it was a land consolidated into an oligarchy, which denied access to anyone outside the family circuit. Chapter three traces corruption as a mechanism through which the state and capital establish sovereignty, particularly through control over labor. Small land plots were under the effective control of larger landowners and their practices. These acquisitions made by particular foreign families prior to WWI, Harambour-Ross argues, should be considered expansions of the British and German empires. Punta Arenas, therefore, rather than being a regional capital from which southern colonialism emanated, was a point of intersection for multiple sources of international power. Chapter four looks at social sovereignty and the creation of worker societies and syndicates, and the growing tensions between capital and labor. The state too expressed problems with foreign capital and began to impose taxes through new customs laws. Violence was of increasing concern, as local police outfits lacked resources and municipal personnel moved around as much as seasonal workers. These forces were beholden to the desires of corrupt politicians and the landed elite, and between 1919 and 1922, violence reached a peak during severe worker repressions in Santa Cruz. Harambour-Ross concludes, “The dialectics of the sovereignty of the State and capital, were built over the expropriation of social sovereignty” (235). Throughout the dissertation, Patagonia is shown to have been a liminal region, both within and beyond the grasp of the national capitals of Buenos Aires and Santiago. Sovereignty is the primary focus—if we are to name one—in Harambour-Ross’ work, and he does an excellent job of identifying multiple sovereigns that are not necessarily “the State.” Methodologically, Harambour-Ross notes that he uses “fragmented pieces of information left behind” to reconstruct this history (128). One could say that this is what all historians do, but of course, which fragments are reassembled and why matters a great deal. Harambour-Ross traces trans-Andean and trans-Atlantic business relationships through invoices, debts, and local complaints, to show the co-production of capital and state enterprises. He uses family genealogies to show patterns of marriages, ties, and contracts that constructed a regional oligarchy. From wool and refrigerated meat to condensed milk, Harambour-Ross’ focus on commodities and business monopolies reconstructs social, political, and economic relations in Patagonia that have generally been taken for granted. As a postcolonial borderlands history, Harambour-Ross does well. He examines a massive territorial space, and while he focuses primarily on the central and southern portion of Patagonia, he provides the most comprehensive history of the region in recent years. While at times it feel more like a comparative history of Argentine and Chile, the connections he draws constitute a solid transnational study. Moreover, in many ways this history is acted out on a passive stage. For all of the mythos that shrouds Patagonia, we get an excellent social, political, and economic history, but with such an emphasis on ‘region,’ the landscape is merely there. While it is refreshing the he does not fetishize the ‘windswept’ landscape, at times it feels like a backdrop with little influence on the difference outcome that he highlights. Nevertheless, his sources and methodology successfully bring together local and foreign groups that are often treated separately, and his use of theory sets up each chapter well—though at times, the front-loading of theory feels disjointed from his case study. These, however, are minor critiques of a dissertation that does a great deal of work on a bi-national region that is integral to contemporary Argentine and Chilean identities, and indeed, one that continues to be hotly contested in domestic and international debates. Harambour-Ross’ study, therefore, should be read by any scholar of Argentina and/or Chile, and will also be useful for scholars interested in borderlands and transnational histories more generally. State University of New York at Stony Brook, 2012, 270 p. Advisors: Brooke Larson, Thomas Klubock. Encuentro entre oficiales de la Armada de Chile e indígenas fueguinos deportados en la Misión de Isla Dawson. Archivo Fotográfico Museo Maggiorino Borgatello, Punta Arenas.